Hi guys! Today I have swatches of the Spring 2017 Pastel set from Moonflower Polish. Since these are handmade by me, and I am biased, I can't provide an honest review for them. However, I can show you pretty pics and a brief description of each along with any other info you might need to know! The Moonflower Polish Spring 2017 Pastels are inspired by fruits and flowers. Although they are pastels, they are still really bright and perfect for the summer as well. They all contain just a hint of shimmer, to add a little extra something. These are not made with neon pigment, so there should be no fading. As always, my polishes are 5 free. Like with my previous collection, they have a lot of pigment and some separation is normal and to be expected over time. 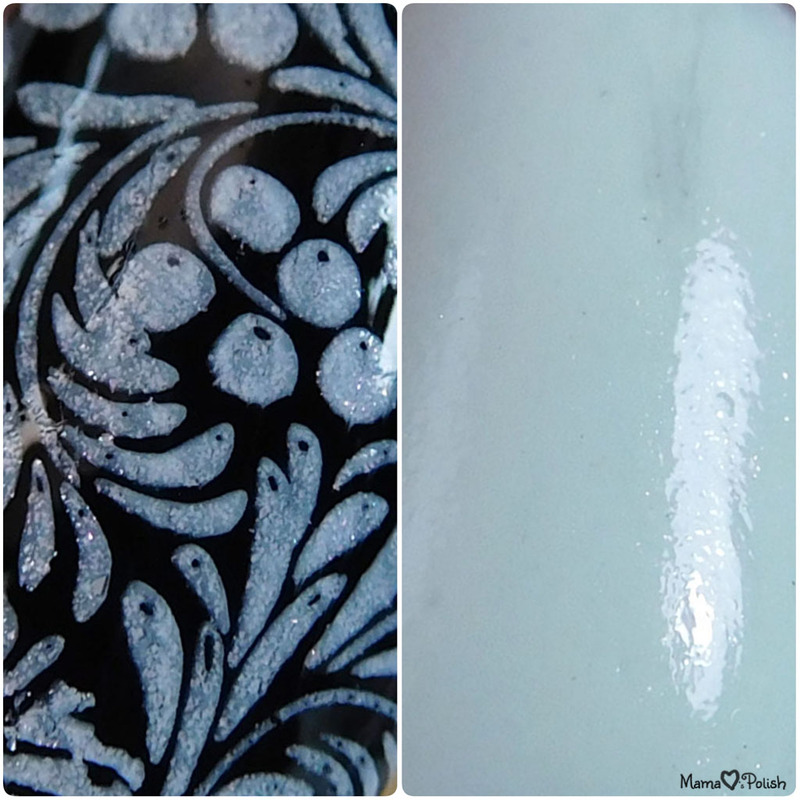 Due to the high amounts of white pigment in these, there's always the risk for UBS (Ugly Bottle Syndrome) as well. In both cases, you should be able to just mix them back up. There was no staining reported with any of these as well. All swatches are over a base of Día (white) and Noche (black) from the Day and Night Duo. I applied them as regular polish in 2 coats on my ringer finger. I used Out the Door top coat to seal and add shine. Strawberry - bright pink with subtle silver shimmer. 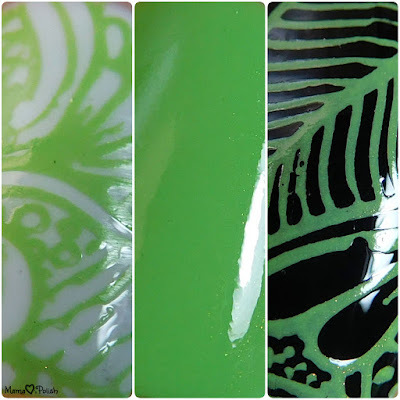 For the swatches I used the Bundle Monster XL White Semi-Squishy Silicone stamper and plate BM-S111 from the Paisley Flow collection. Mango - peachy-orange with golden shimmer. 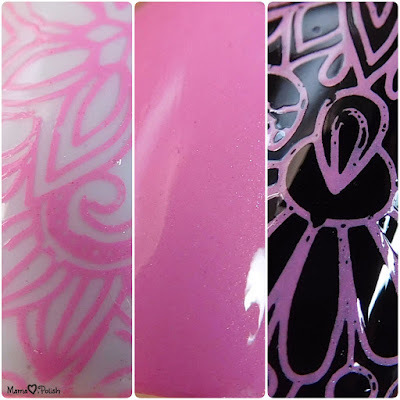 For the swatches I used the Messy Mansion Crystal Stamper (clear stamper) and Bundle Monster plate BM-S120 from the Paisley Flow collection. Lemon - bright lemon yellow with silver shimmer. 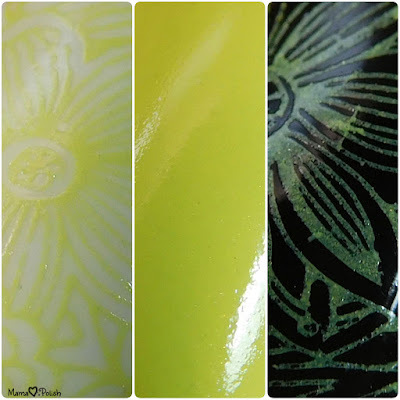 For the swatches I used Bundle Monster plate BM-S105, from the Shangri-La collection, which is a very shallowly etched plate with fine lines and it gave me a bit of trouble. I added a couple of drops of thinner to my bottle of Lemon and tried different stampers. 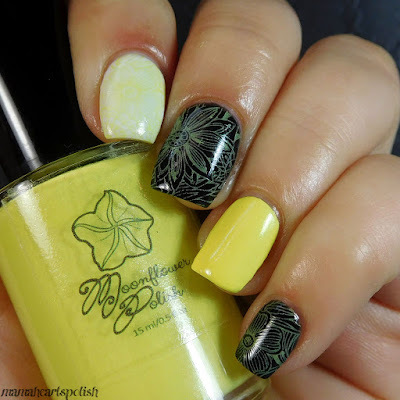 On my index finger and middle finger, I used the Messy Mansion Medium Soft Yellow stamper set. 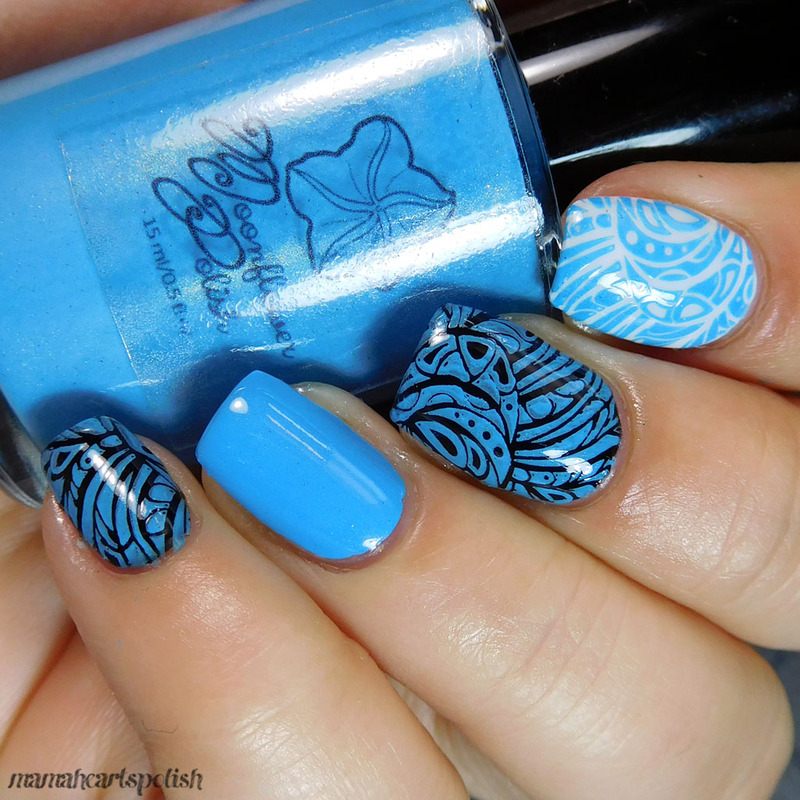 For my pinky, because it doesn't have much of a c-curve, I used the Messy Mansion Medium Firm Blue stamper set. Apple - apple green with golden shimmer. For the swatches I used Bundle Monster plate BM-S114 and the Messy Mansion Crystal Stamper. Mint - minty green with silver shimmer. 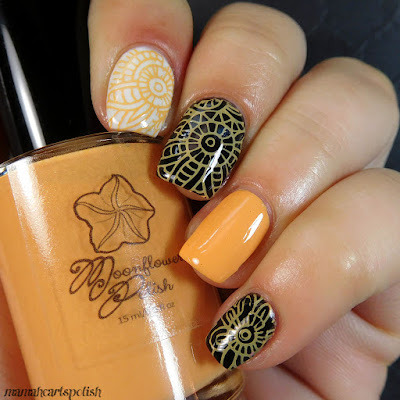 For the swatches I used Bundle Monster plate BM-XL209 (Lucy's Stash from the Blogger collab set) and Messy Mansion Crystal Stamper. Hydrangea - bright pastel blue with a hint of gold and silver shimmer. For the swatches I used Bundle Monster plate BM-XL209 (Lucy's Stash from the Blogger collab set) and the Bundle Monster XL White Semi-Squishy Silicone stamper. 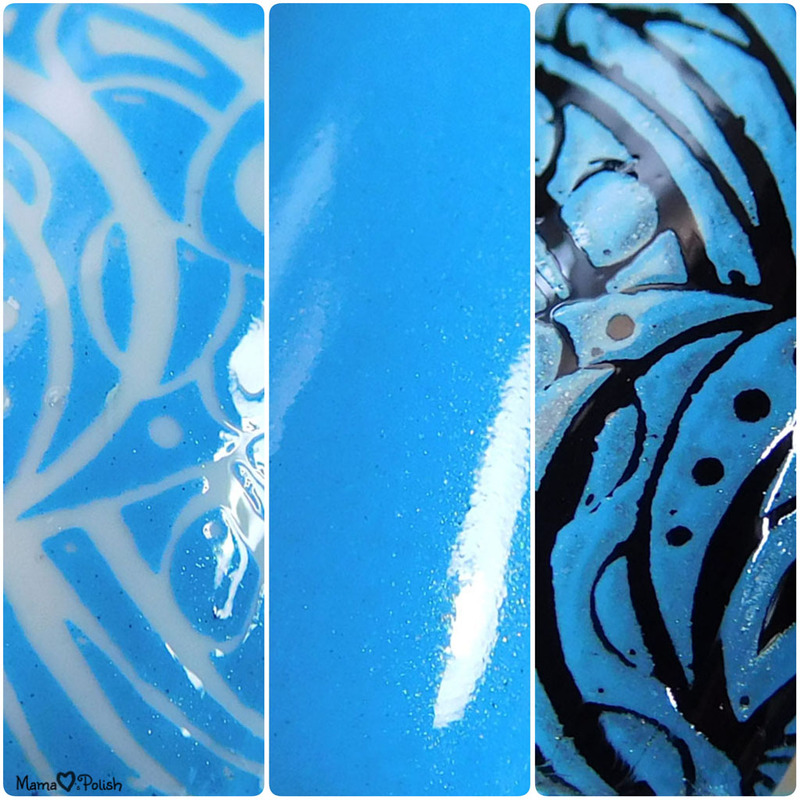 Periwinkle - periwinkle blue with silver shimmer. 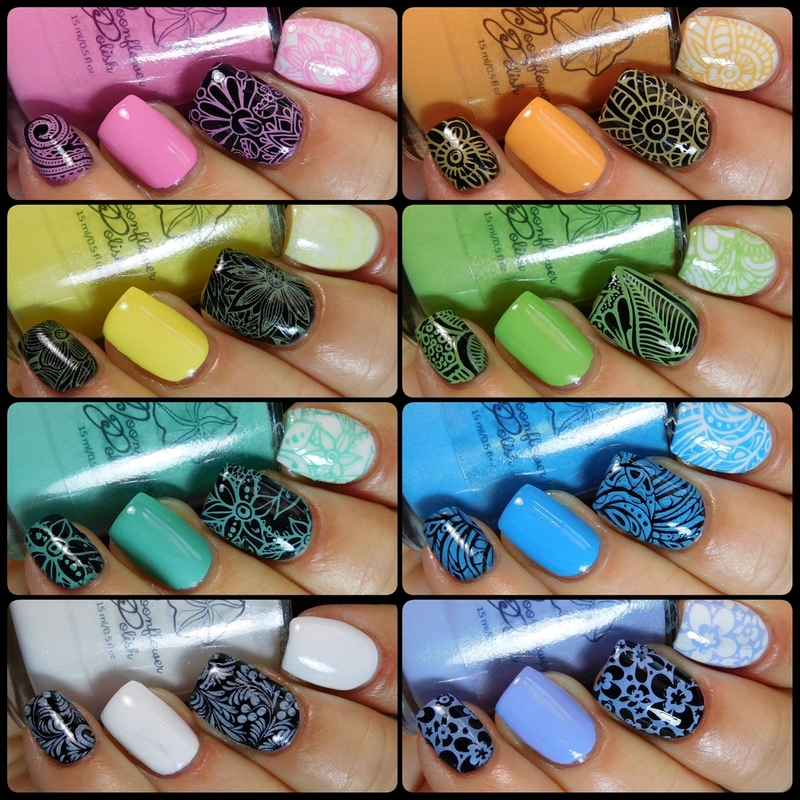 For the swatches I used MoYou London Pro 09 and the Bundle Monster XL White Semi-Squishy Silicone stamper. Moonflower - sheer white with color shifting red/green/gold shimmer. For the swatches I used Pet'la Plates Golden Russian and the Bundle Monster XL White Semi-Squishy Silicone stamper. All of the colors are in stock at www.moonflowerpolish.com! Full size 15ml bottles are $9 and $70 for the set of 8, mini 7ml bottles are $5 and $38 for the set. Follow me on social media to stay up to date with the latest info regarding restocks and new releases! 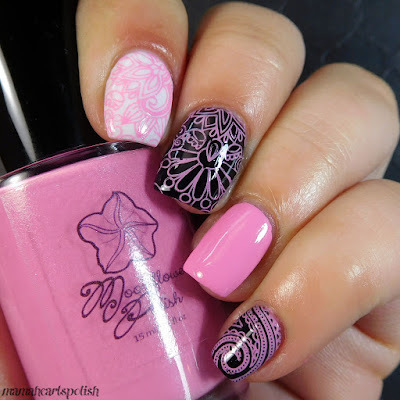 Find Moonflower Polish on IG @moonflowerpolish (and don't forget to use #moonflowerpolish so I can repost your pics). On FB: @moonflowerpolish and the fan group Painted Moonflowers. 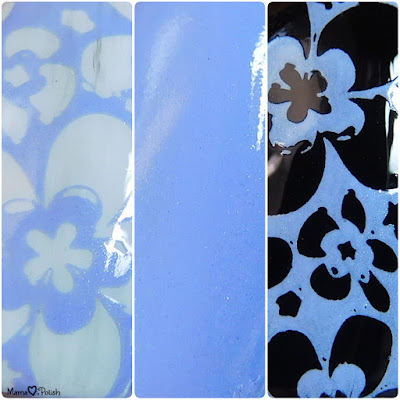 10 comments on "Moonflower Polish - Spring 2017 Pastels - Swatches"
These are all really pretty. I really like the pink. 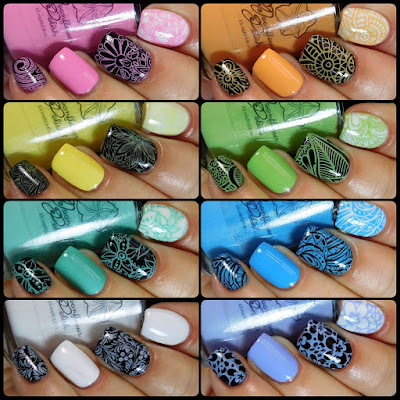 Love this collection, especially that you can wear them as well as stamp with them. Moonflower is my favorite with that beautiful pearlesence! Gorgeous collection! I especially love the shimmery white! 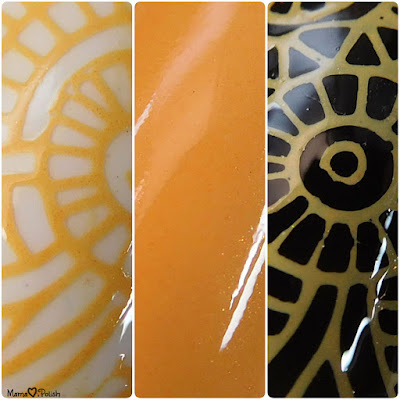 These are look so fantastic, I cannot wait to make my first purchase from you! 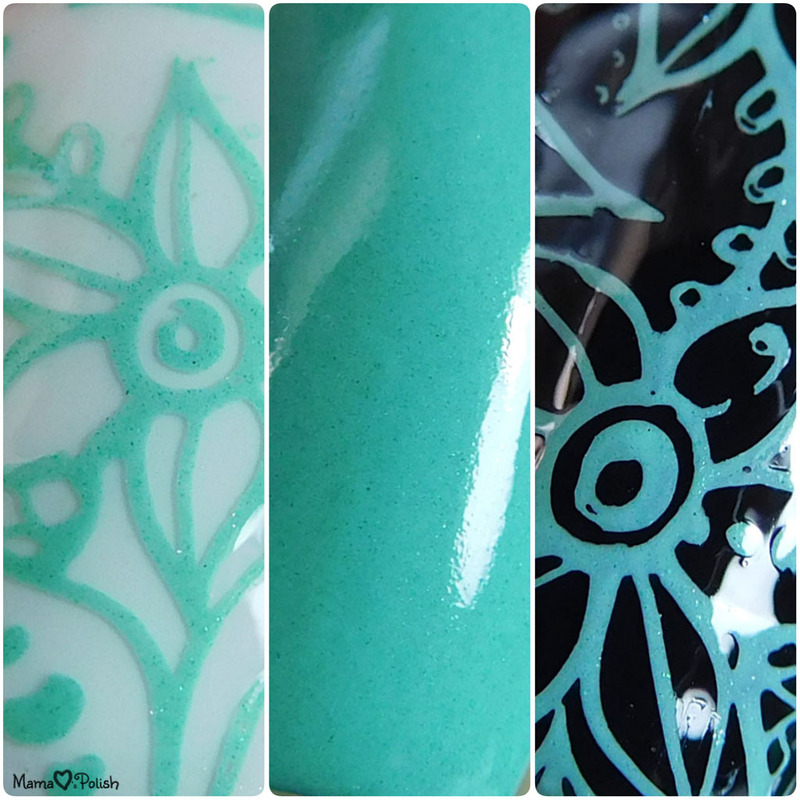 I can't put into words how much I love these pastels, especially mint! All of these colors are perfect! And they stamp great! These colors stamp so well. So crisp! 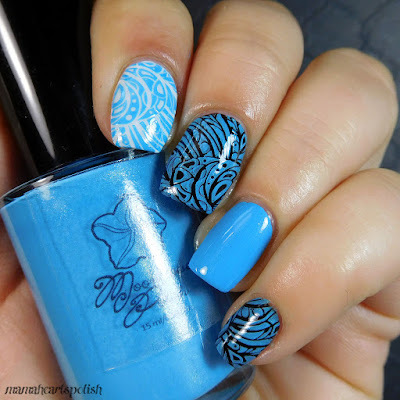 You are rocking the stamping polishes! I just used another of yours last night!